We would just to remind you all about the Venous thromboembolism conference taking place on Friday & Saturday September 18/19th. It is a fantastic line up of world experts giving a comprehensive update on all aspects of this topic which is relevant to most of our daily working lives. Online booking is now possible at http://vtedublin2015.org/registration/ and at A DISCOUNTED RATE FOR TRAINEES OF 100 EURO FOR THE 2 DAY conference it is excellent value, and easily accessible as it is just down the road in Croke Park. There will be the option for a tour of the Croke Park Museum afterwards and dinner with lively entertainment and discussion afterwards on the Friday night. 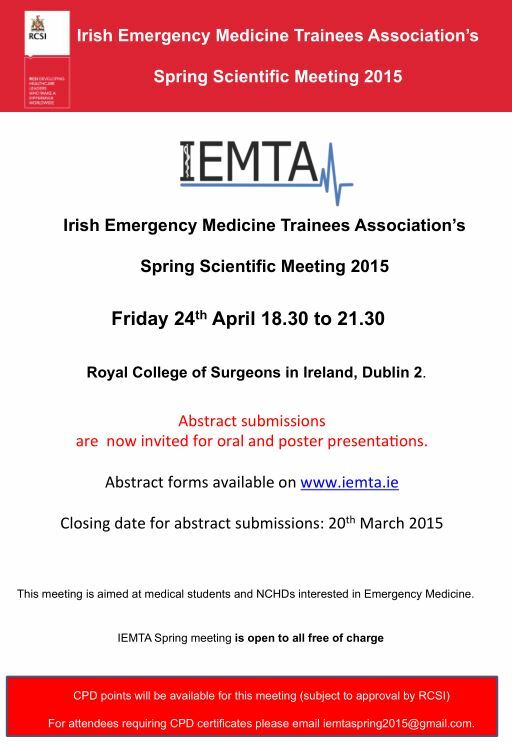 Attached is the programme and book of abstracts for IEMTA Spring Meeting this Friday 24th April at 1830 in RCSI. Please note that we will not be providing hard copies of the book of abstracts on the evening and kindly ask you to bring your own copy or have it downloaded on your device. IEMTA received a great response to our abstract call for our upcoming academic meeting on the 24th April in RCSI- we have selected 7 oral speakers and a record number of poster presentations. All authors should have received confirmation by the organising committee and if not please contact us on the email below. A book of abstracts will be made available online just ahead of the meeting. Please find attached the provisional program and we would encourage all to attend as it promises to be a great night. We would be grateful if you could post the poster in your ED and disseminate the details to all who may be interested. The closing date for oral and poster submissions to the academic meeting is the 20th March. We would ask you to strongly encourage all in your department including medical students/ interns/ SHOs to submit an abstract. We endeavour to provide a friendly platform for trainees to present their work at a national meeting. The scheduled talks promise to be engaging, stimulating and thought provoking. Our guest speakers include Dr Edel Duggan, clinical director of the national poisons centre, Dr Ike Okafor, Consultant in Paediatric Emergency Medicine and Dr Vicky Meighan, SpR in EM. We would encourage you to inform your patients and their family members of these videos. IEMTA Spring Academic meeting will be held on Friday 24th April 18.30 to 21.30 in RCSI, Dublin 2. Abstract submissions are now invited for oral and poster presentations. Closing date for abstract submissions: 20th March 2015. Full details of the programme will be available in due course. This meeting is aimed at medical students and NCHDs interested in Emergency Medicine. IEMTA Spring meeting is open to all free of charge. CPD points will be available for this meeting (subject to approval by RCSI). For attendees requiring CPD certificates please email iemtaspring2015@gmail.com. Photos from the Annual Scientific Meeting of the Irish Association for Emergency Medicine (IAEM) are now available in our photo gallery. Thanks to Jim Leonard for the photos!